Menubar item displays mouse location coordinates. Is there a better alternative to MouseStat? Is MouseStat really the best app in System category? Will MouseStat work good on macOS 10.13.4? 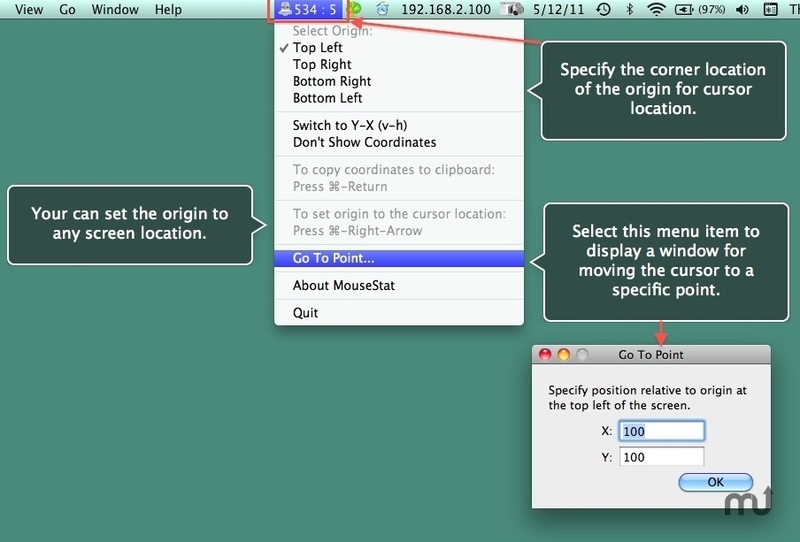 MouseStat displays the coordinates of your mouse in the menu bar, and copies the coordinates to the clipboard and console via the hot key Command-Return. You have the option to set the origin to the top-left, bottom-left, bottom-right or top-right of the screen. Or use the hot key Command-Right-Arrow to set the origin to the current location. You can also have MouseStat display coordinates in reverse order, by selecting "Switch to Y-X" or not at all by selecting "Don't Show Coordinates." Added a new menu item "Go To Point" that presents a window to specify coordinates, relative to an origin at the top left of your screen, to move the mouse to. Added new menu items for reminding you of the two previous keyboard commands: ⌘-Right-Arrow to set the origin to the current mouse location, and ⌘-Return to copy the current coordinates to the clipboard and the console log. MouseStat needs a rating. Be the first to rate this app and get the discussion started! Use the "Go To Point" menu item to move the cursor to any screen location of your choice, relative to the top left corner of the screen as origin. Put the application into your login items if you want it to launch automatically whenever you log in. Go to System Preferences "Accounts" and then click the "Login Items" pane. Then simply drag MouseStat into the list. MouseStat is part of the Limit Point Software Utilities Bundle : http://www.limit-point.com/Utilities.html. Purchase a Utilities password to activate all the utilities. Upgrades are always free, new utilities are always included!